Looking for creative ways to cook up the rest of last summer’s salmon? We can help. It's the quintessential Alaska problem: summer is around the corner, but you've yet to eat your way through the salmon haunting the back of your freezer, now past the 6-month mark. If the fish is hopelessly freezer-burned and you live in the Anchorage area, you might consider donating it to Bird TLC. But assuming it was sealed airtight and is still edible — just past its prime, perhaps — you might be looking for some creative ways to get through your stockpile fast, and we are here to help. Here are a couple of our recipe columnists' favorite preparations for last summer's salmon. Do you have a favorite recipe or method that helps get through salmon that's been in the freezer a long while? We'd love to hear about it! You can us at play@adn.com. Last Friday, I had a cooking demo and book-signing at the Denai'na Wellness Center in Kenai. Among the many questions I received during the demo, one theme clearly emerged: Alaskans are always looking for new and creative ways to use up last summer's salmon this time of year. You know the salmon I'm talking about: those less-than-perfect fillets sitting in the deep freeze, looking a little frostbitten and forlorn, their color fading just a bit, their fishy flavor intensifying. Maybe they are the ones that didn't get filleted or packaged quite as beautifully as the rest, so they were set aside, waiting for inspiration to strike. But inspiration never struck and here we are. I'm not afraid of last summer's salmon. It affords us the opportunity to embrace bolder flavors and to get a little more creative than we might usually. While less than ideal in the freshness department, springtime salmon still has loads of potential. For example, I love to use last summer's salmon in lettuce wraps. You take an imperfect fillet, glaze it in a spicy sauce, or season it heavily with blackening spices, and wrap it up with some vibrant, fresh produce. My honey Sriracha salmon lettuce wraps from a previous column or my blackened salmon lettuce wraps with mango salsa and avocado cream from "The Alaska from Scratch Cookbook" are both excellent options here. My favorite way to use up older salmon is to make salmon burgers. When you chop up the salmon, mix it together with panko, garlic, soy sauce, and green onions, and form it into a burger patty, it really doesn't matter how imperfect the fish was to begin with. 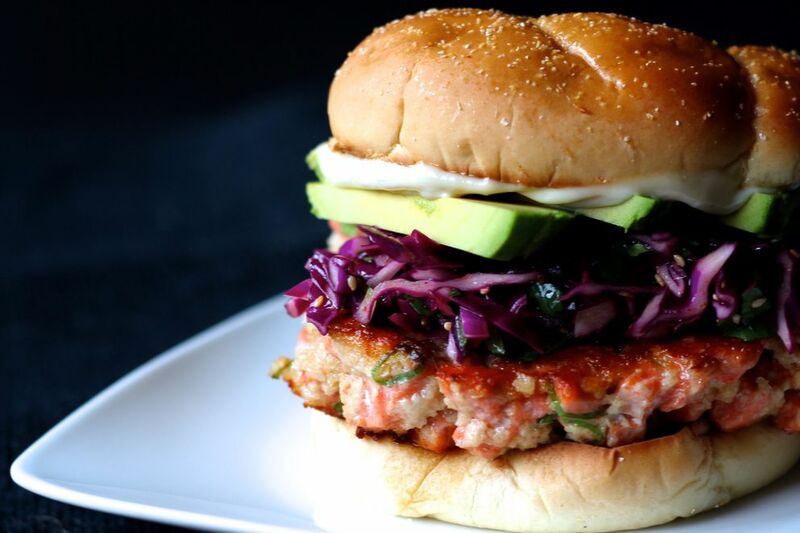 In my cookbook, I top my salmon burgers with a crunchy sesame slaw finished with slices of ripe avocado and spicy wasabi mayo. Just this week, I received a message on Instagram from an Alaskan couple who tried the recipe from the cookbook and they declared it a "damn good burger." I agree. It's one of my favorite recipes in the book. To make the slaw: In a mixing bowl, combine the vinegar, sesame oil, Sriracha, sugar, lime juice, sesame seeds and salt. Whisk to combine and dissolve sugar. Add the cabbage and cilantro and toss to coat. Refrigerate until ready to assemble the burgers. To make the wasabi mayo: In a small bowl, stir together the mayonnaise, wasabi, and soy sauce until smooth. Cover and refrigerate until ready to serve. To make the salmon burgers: In a mixing bowl, combine the salmon, panko, green onions, ginger, garlic, egg whites, soy sauce, lime juice and salt. Fold together until well combined. On a large cutting board, shape the mixture into four evenly sized round patties. Place a large non-stick skillet over medium-high heat. Swirl the pan with avocado oil. When the oil is hot, carefully transfer 2 salmon burgers to the pan. Cook for 2-3 minutes, or until seared and browned on the bottom. Turn and cook another 2-3 minutes on the other side. Remove the burgers from the heat and repeat with remaining patties. Place the toasted burger buns on serving plates. Place a salmon burger on each bottom bun. Using a slotted spoon, top each burger with a generous heap of sesame slaw. Top the slaw with avocado slices Smear each top bun liberally with wasabi mayo and place them on top of the burgers. Serve promptly. Recipe from The Alaska from Scratch Cookbook. Bulgogi, one of Korea's most popular beef dishes, is redolent of garlic and green onion, with a touch of sweetness from brown sugar and fresh grated pear or apple. For home cooking, I like to take the same flavors and use them with ground meat for bulgogi-style meatballs. Frozen salmon holds up well to bold flavors. 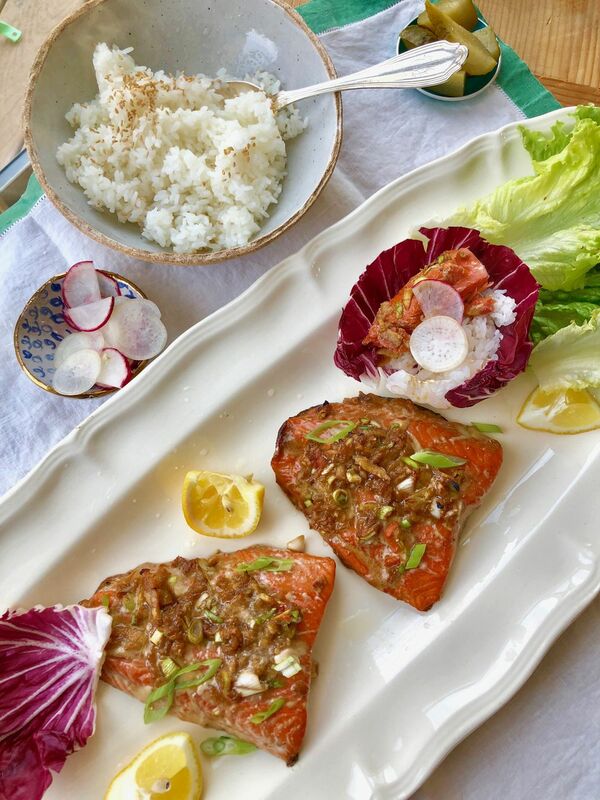 Keep it simple and serve this salmon with lettuce cups and a variety of pickled and fresh vegetables; any leftovers are great in frittatas, tossed with pasta or rice, or in grilled vegetable salad. 1. In a large bowl, combine the soy sauce, fish sauce, if using, brown sugar, pear, garlic, green onion, ginger, pepper, hot chile sauce and sesame oil; whisk to combine. Add salmon and turn to coat both sides. Cover and let marinate 20 minutes (chill in refrigerator if your kitchen is warm). 2. While salmon is marinating, preheat oven to 500 degrees. Remove salmon from marinade. Place fillet, skin side down, on a lightly greased rimmed baking sheet. Pour some of the extra marinade over. Roast salmon 7 to 8 minutes. Check that salmon is cooked to your preferred temperature. Serve with lettuce leaves, steamed rice, cucumbers, radishes, and/or pickles.